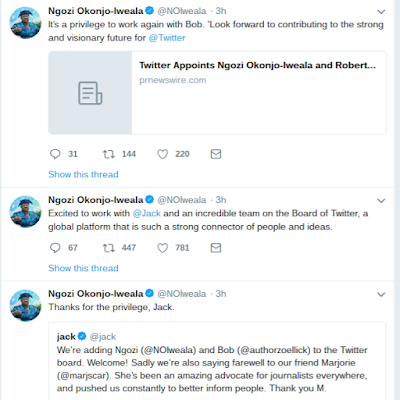 Twitter, Inc. (NYSE: TWTR) today announced the appointments of Ngozi Okonjo-Iweala and Robert Zoellick to Twitter’s Board of Directors (the “Board”) as new independent directors, effective immediately. Marjorie Scardino will be stepping down from the Board for personal reasons at the end of the year. 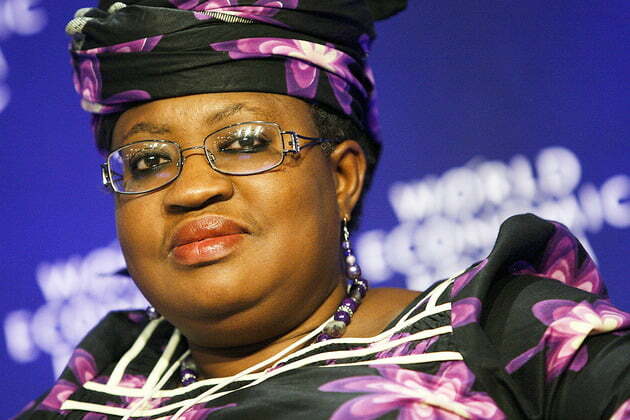 About Dr. Ngozi Okonjo-Iweala Dr. Okonjo-Iweala has served as a Senior Advisor to Lazard, Ltd., a global financial advisory and asset management firm, since September 2015. Prior to joining Lazard, she served as the Minister of Finance of Nigeria from July 2003 until June 2006 and as the Minister of Finance and Coordinating Minister for the Economy of Nigeria from August 2011 until May 2015. She has been a member of the Board of Directors of Standard Chartered Plc, a multinational banking and financial services company, since November 2017. Dr. Okonjo-Iweala has served as the Board Chair of the Global Alliance for Vaccines and Immunization (GAVI) since January 2016. Dr. Okonjo-Iweala holds a Ph.D. from the Massachusetts Institute of Technology and an A.B. from Harvard University. About Robert Zoellick, Mr. Zoellick has served as the Chairman of the Board of Directors of AllianceBernstein Holding L.P., a global investment management firm, since April 2017. Mr. Zoellick has also served as a board member of Temasek Holdings (Private) Ltd., a Singaporean corporation principally engaged in the business of investment holding, since August 2013. He has served as a Senior Counselor to the Brunswick Group, global public affairs, and communications firms, since May 2017. Since July 2012, he has also been a Senior Fellow at the Belfer Center for Science and International Affairs at Harvard University’sKennedy School of Government. From October 2013 until September 2016, he served as Chairman of the Board of International Advisors at the Goldman Sachs Group. From July 2007 until June 2012, Mr. Zoellick served as President of the World Bank Group. From 2006 to 2007, Mr. Zoellick served as Vice Chairman, International and a Managing Director of Goldman Sachs. Mr. Zoellick served as the Deputy Secretary for the U.S. Department of State from 2005 until 2006 and as the U.S. Trade Representative from 2001 to 2005. From 1985 to 1993, Mr. Zoellick held various posts in the U.S. government, including Counselor to the U.S. Secretary of the Treasury, Under Secretary of State, and Deputy Chief of Staff at the White House. Mr. Zoellick holds a J.D. from the Harvard Law School, an M.P.P. from Harvard’s Kennedy School of Government, and a B.A. from Swarthmore College. 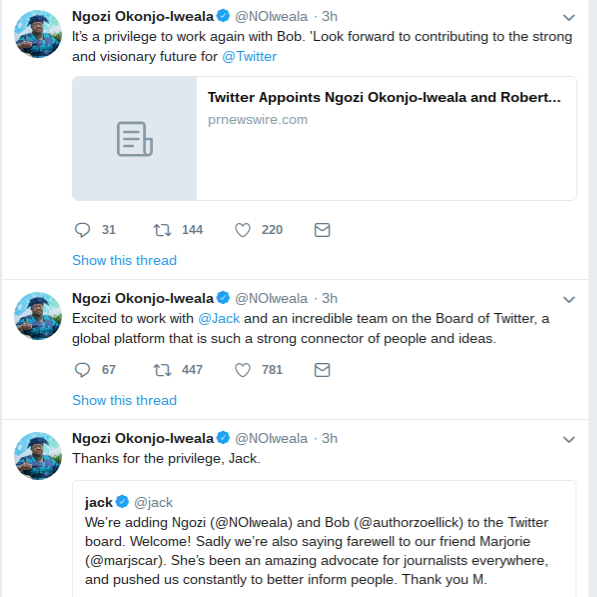 About Twitter, Inc. Twitter, Inc. (NYSE: TWTR) is what’s happening in the world and what people are talking about right now. On Twitter, live comes to life as conversations unfold, showing you all sides of the story. From breaking news and entertainment to sports, politics and everyday interests, when things happen in the world, they happen first on Twitter. Twitter is available in more than 40 languages around the world. The service can be accessed at twitter.com, on a variety of mobile devices and via SMS. For more information, visit about.twitter.com or follow @twitter. For information on how to download the Twitter and Periscope apps, visit twitter.com/download and periscope.tv.